As an adult in the professional workplace, it can sometimes feel like it’s too late for you to fix those crooked or misaligned teeth and finally have the perfectly straight smile you’ve always wanted. After all, traditional braces are uncomfortable and frustrating. You’ve worked hard to create and maintain a polished and successful image through your daily life. You definitely don’t deserve to have all of that tainted by clunky metal braces that make you feel like you’ve been sent back to junior high. Luckily, Dr. Weinman and his team are committed to providing you with treatments that work quickly and produce lifelong results, all while keeping in mind your comfort. That’s why we’re happy to offer you Invisalign as a cosmetic option at our Westfield, NJ office. With the help of Invisalign, you’ll finally have a seamless solution to your smile needs, leaving you with perfectly straight teeth you’ll be proud to show off. 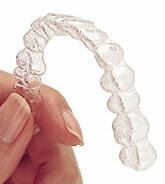 When undergoing Invisalign treatment, you’ll use a series of clear aligners, custom-made to fit your unique mouth. Each aligner will move your teeth incrementally then be replaced by a new one every two weeks. Dr. Weinman will also ensure that your teeth are moving properly by examining them every six weeks. That’s all there is to it! There are several benefits to using Invisalign, the biggest one being that they are virtually undetectable to those around you. You’ll be able to reap all the benefits of braces without ever having to spend one second worrying about embarrassment. In addition, Invisalign braces are comfortable and easily removed, meaning you won’t have to make any changes to your diet or oral hygiene routine. Best of all, while treatment time varies, a majority of patients who undergo Invisalign are finished in less than one year – a much quicker alternate to traditional braces, which can take multiple years to straighten your teeth. Do you think Invisalign might be the right choice for you? Dr. Weinman and his team can provide you with comfortable and personalized service that’s sure to bring a smile to your face. Call our Westfield, NJ office to schedule a consultation with Dr. Weinman. We also gladly serve patients from Scotch Plains, Fanwood, Cranford, Mountainside, and beyond.